I had the most amazing trip with I Bike Tuscany. Our tour was extremely well organized and our guide made absolutely sure that all our needs were met. The bike routes were off the beaten track, with beautiful countryside and little traffic. Although the uphills were tough, the scenery and destinations were well worth the effort. 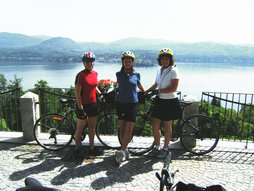 The quality of the accommodations, bikes, included meals and wine tastings were all excellent. The guided tours of the medieval towns, historic sites and vineyards were informative and a blast. I can't wait to go back to Italy and take another tour with I Bike Tuscany.